Aaron Ramsey is joining Napoli's Serie A rivals Juventus on a free transfer at the end of the seasonArsenal's Europa League quarter-final tie with Napoli is "still 50-50" according to Gunners boss Unai Emery, despite his side winning the first leg 2-0 at Emirates Stadium.Aaron Ramsey converted Ainsley Maitland-Niles' pass to finish off a good team move and give the hosts the lead.Kalidou Koulibaly then scored an own goal when he deflected Lucas Torreira's shot past goalkeeper Alex Meret. The impressive Meret stopped the Gunners winning by more.Napoli, who are second in Serie A, host the Gunners in the second leg next Thursday at the San Paolo Stadium (20:00 BST). "The first leg was very important to take a good result," said Emery. "We deserved to win, but we know it is going to be very difficult there. "Their performances at home are usually very strong. We will plan to win the match, but we need to have a lot of respect for them. It is still 50-50. Our challenge is to be competitive away. Sometimes away we lose the spirit we have at home. "Napoli boss Carlo Ancelotti said he is still "confident" of progressing to the last four. "The result is difficult to change but we have 90 minutes left," the Italian said. Napoli coach Ancelotti has won the Champions League three times, twice with AC Milan and once with Real Madrid, but has never won Europe's second competition.He is lucky his side, the 1989 Uefa Cup winners, still have a chance after a lacklustre display in north London.They had two efforts on target, a Koulibaly header and low 20-yard strike from substitute Adam Ounas, both saved by veteran Petr Cech.However, unlike Arsenal, they do not need to win the Europa League to give them a Champions League safety net, as they sit comfortably second in the Italian league. "The first half we were really bad. We weren't brave enough to control the game as we wanted," Ancelotti said. "In the second half we showed we create chances. It will be a different environment with our home crowd behind us. I'm confident." 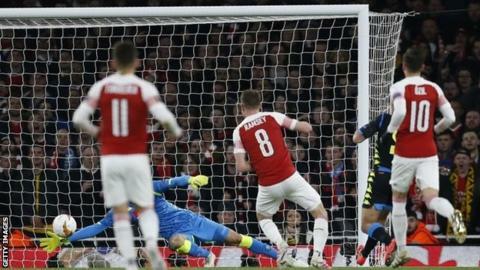 Posted at 90'+5' Second Half ends, Arsenal 2, Napoli 0.Posted at 90'+3' Foul by Piotr Zielinski (Napoli).Posted at 90'+3' Laurent Koscielny (Arsenal) wins a free kick in the defensive half.Posted at 90' Delay over. They are ready to continue.Posted at 89' Delay in match Laurent Koscielny (Arsenal) because of an injury.Posted at 89' Attempt missed. Adam Ounas (Napoli) right footed shot from the right side of the box is close, but misses the top right corner. Assisted by Piotr Zielinski following a corner.Posted at 89' Corner, Napoli. Conceded by Sokratis.Posted at 88' Attempt missed. Pierre-Emerick Aubameyang (Arsenal) right footed shot from the right side of the box is close, but misses to the right. Assisted by Henrikh Mkhitaryan following a fast break.Posted at 86' Jose Callejon (Napoli) wins a free kick in the defensive half.Posted at 86' Foul by Nacho Monreal (Arsenal).Posted at 85' Attempt saved. Adam Ounas (Napoli) left footed shot from outside the box is saved in the bottom right corner.Posted at 85' Corner, Napoli. Conceded by Laurent Koscielny.Posted at 84' Allan (Napoli) wins a free kick in the defensive half.Posted at 84' Foul by Aaron Ramsey (Arsenal).Posted at 83' Offside, Napoli. Kalidou Koulibaly tries a through ball, but Adam Ounas is caught offside. Posted at 82' Substitution, Napoli. Adam Ounas replaces Fabian Ruiz. Posted at 82' Substitution, Napoli. Amin Younes replaces Lorenzo Insigne.Posted at 81' Attempt missed. Aaron Ramsey (Arsenal) right footed shot from the centre of the box is too high. Assisted by Henrikh Mkhitaryan.Posted at 80' Elseid Hysaj (Napoli) wins a free kick in the defensive half.Posted at 80' Foul by Alex Iwobi (Arsenal).Posted at 79' Offside, Napoli. Fabian Ruiz tries a through ball, but Mario Rui is caught offside.Posted at 79' Jose Callejon (Napoli) wins a free kick on the right wing.Posted at 79' Foul by Sead Kolasinac (Arsenal).Posted at 78' Corner, Napoli. Conceded by Ainsley Maitland-Niles. Posted at 77' Substitution, Arsenal. Mohamed Elneny replaces Lucas Torreira.Posted at 76' Fabian Ruiz (Napoli) wins a free kick in the defensive half.Posted at 76' Foul by Henrikh Mkhitaryan (Arsenal).Posted at 73' Delay over. They are ready to continue.Posted at 72' Delay in match Lucas Torreira (Arsenal) because of an injury.Posted at 72' Attempt missed. Piotr Zielinski (Napoli) right footed shot from the centre of the box is high and wide to the left. Assisted by Lorenzo Insigne.Posted at 71' Mario Rui (Napoli) wins a free kick in the defensive half.Posted at 71' Foul by Aaron Ramsey (Arsenal).Posted at 69' Corner, Arsenal. Conceded by Alex Meret.Posted at 69' Attempt saved. Ainsley Maitland-Niles (Arsenal) right footed shot from the centre of the box is saved in the top centre of the goal.Posted at 68' Offside, Napoli. Kalidou Koulibaly tries a through ball, but Lorenzo Insigne is caught offside. Posted at 67' Substitution, Arsenal. Henrikh Mkhitaryan replaces Mesut Ozil. Posted at 67' Substitution, Arsenal. Alex Iwobi replaces Alexandre Lacazette. Posted at 66' Substitution, Napoli. Arkadiusz Milik replaces Dries Mertens.Posted at 65' Corner, Napoli. Conceded by Ainsley Maitland-Niles.